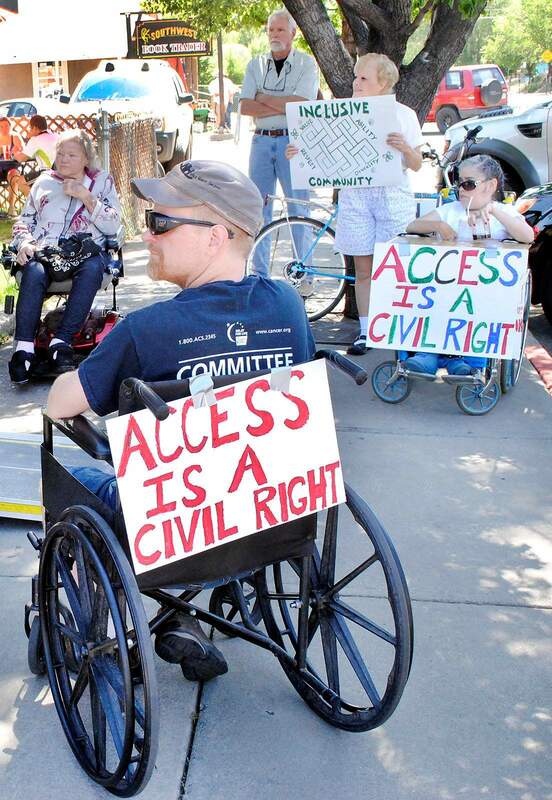 Southwest Center for Independence sponsored a gathering around a former sandwich shop on the south end of downtown Durango in 2013 to protest the inaccessible entrance and offer possible solutions to improve disabled accommodations. A Florida man has filed dozens of ADA lawsuits across Colorado, including about 10 in Durango. 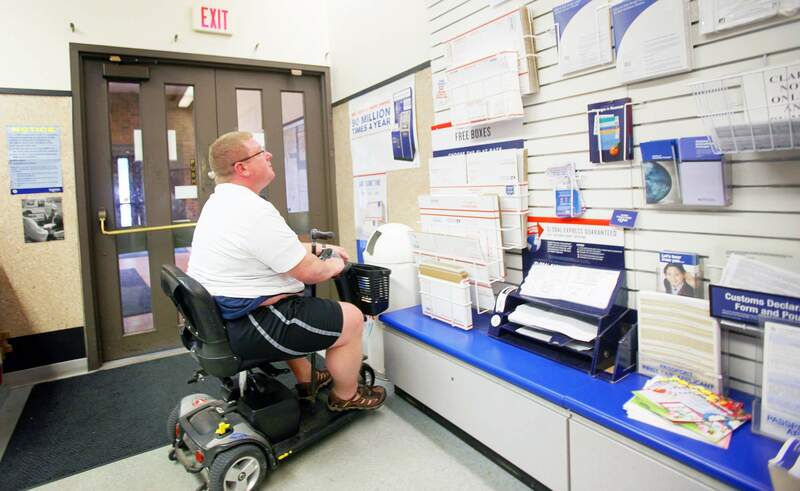 Jason Ragsdale with the Southwest Center for Independence can only stare at shipping supplies for sale at the Durango Post Office during an effort to raise awareness about accessibility issues last year, a day before the 25th anniversary of the signing of the Americans with Disability Act. About 10 ADA lawsuits have been filed against business owners in Durango. A Florida man has filed dozens of lawsuits against small businesses across Colorado, including several in Durango, alleging violations of the Americans with Disabilities Act. Santiago Abreu is a self-identified “tester” for ADA compliance, according to the dozens of federal lawsuits he has filed since July 2015 in Colorado. But some say Abreu’s efforts are an attempt to extort money from small businesses because he quickly offers to settle for cash. Local businesses that have been sued include Orio’s Roadhouse, College Drive Cafe, Grassburger, Home Slice Pizza, General Palmer and DoubleTree Hotel. Abreu apparently visited Durango in August and again in March. During his visits, he went into numerous businesses, apparently taking note of alleged ADA violations, including bathroom counters and soap dispensers that sit too high; grab bars that have improper length or spacing; and insufficient door, aisles or floor space for maneuvering. Instead of notifying business owners about his concerns, he filed federal lawsuits against them, said Marla C. Underell, a Durango lawyer representing Orio’s Roadhouse. He’s using law firms in Colorado, Arizona and Florida to file complaints. She has contacted the federal court in Colorado to notify it of “related cases,” in which a common party and law firms file serial lawsuits. Underell and her clients, Rob and Heidi Orio, owners of Orio’s Roadhouse, are considering a counterclaim against Abreu for abuse of process. They also have notified the FBI and Colorado Attorney General’s Office. The Colorado attorney general said Monday that plaintiffs can sue under Title III of the ADA without exhausting administrative remedies. “Unfortunately, businesses don’t have many options, other than to try to ensure ADA compliance and fight the lawsuits,” Erin Lamb, spokeswoman for the attorney general in Denver, wrote in an email to the Herald. Legislation has been introduced in California and at the federal level to address abuses. A bill in California, where a disabled attorney has sued thousands of small businesses, would give businesses 90 days after notification to come into compliance and target “high-frequency litigations,” according to The Mercury News. Abreu is from Palm Beach County, Florida, and apparently visits Colorado for “certain medical treatments” that are not available in Florida, according to one of his complaints. In addition to Durango, he’s filed lawsuits against small businesses in Breckenridge and Telluride. One of Abreu’s attorneys, Jack S. Kallus of Fort Lauderdale, Florida, declined to comment for this story. Another of his attorneys, Afshin Afsharimehr of Phoenix, said he would communicate by email, but did not return an email seeking comment. Underell encouraged businesses to look at 1991 and 2001 ADA guidelines and consult a contractor or architect who is knowledgeable with ADA standards to see if they need to make retrofits. The ADA is a civil rights law passed by Congress in 1990 to protect against discrimination based on disabilities. Part of the law requires businesses to provide reasonable public accessibility to products, services and facilities. Businesses aren’t generally required to make hundreds of thousands of dollars in alterations to become compliant, Underell said. And a grandfather provision can protect businesses from making major alterations until they do a remodel or undergo a use change, she said. Jason Ragsdale, program manager at Southwest Center for Independence and a member of Durango’s Accessible Communities Team, which advocates for greater accessibility, said “drive-by lawsuits” such as these are occurring nationwide. ACT has tried to head off ADA lawsuits by working with local businesses and educating them about ADA standards, Ragsdale said. The city of Durango has made money available to match half of the improvements businesses make to come into compliance. But so far, businesses have been reluctant to make changes, he said. shane@durangoherald.comAn earlier version of this story erred in reporting The Bookcase & Barber (Speakeasy) had been sued. A business by the name of SM Speakeasy, Inc., in Denver was sued.